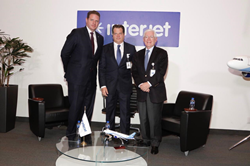 L to R – William Shaw, Interjet's new CEO, Miguel Alemán Magnani, Chairman and President of ABC Aerolíneas, S.A. de C.V and José Luis Garza, Interjet's outgoing CEO at the announcement of the new CEO. Interjet Airlines announced that William Shaw will succeed José Luis Garza as Chief Executive Officer, effective immediately. Garza is set to join Interjet Airlines’ Board of Directors. The announcement was made by Miguel Alemán Magnani, Chairman, and President of ABC Aerolíneas, S.A. de C.V., the parent company of Interjet Airlines. “2018 was a remarkable year for Interjet Airlines. We made great progress as a company as we continued to make significant investments in our team members, our fleet and our product,” said Miguel Alemán Magnani,” Chairman and President of ABC Aerolíneas, S.A. de C.V., the parent company of Interjet Airlines. “Adding someone with William’s experience, entrepreneurship and understanding of the aviation industry to our team, will be of great benefit to the continued growth of the airline, particularly our international business and all of us at Interjet are excited to have him on board,” he added. “At the same time, I want to personally thank José Luis Garza, who has successfully guided Interjet from our humble beginning flying just three aircraft to four destinations in Mexico to today, where Interjet has become one of the world’s fastest growing airlines in North America,” he added. “I am honored to be joining the Interjet team,” said William Shaw, Interjet’s new CEO. “These are very challenging and competitive times in the airline industry, and I have been very impressed with Interjet’s success to date. Our ‘Value Proposition’ of offering the flying public much more for less along with the customer experience we provide business and leisure travelers have been one of the keys to differentiating Interjet from other carriers in our class, and we will continue to do so,” he added. William Shaw has over 26 years of experience in the aviation industry having started his career at a check-in desk in Mexico City Airport to his latest entrepreneurial venture of a low-cost start-up in the Dominican Republic. While a student at Stanford University’s Graduate School of Business, Shaw wrote his Master’s thesis about starting a low-cost carrier (LCC) in Colombia which later became a reality with the launch of VivaColombia in 2012. Shaw founded VivaColombia as CCO and later became its CEO. In 2015, he left to set up VivaLatinAmerica Holdings and launched Viva Air, VivaColombia’s sister airline and first value airline in Peru. In February 2018, Shaw joined the Board of Directors of Green Africa Airways and in May 2018, started the Flycana Project, the first LCC in the Caribbean. For more information regarding our new CEO or to make a reservation, visit http://www.interjet.com or in the U.S. call (866) 285-9525. Interjet is an international airline based in Mexico City carrying more than 13 million passengers annually within Mexico and between Mexico, the United States, Canada, Central, and South America. In all, it provides air service to 53 destinations in nine countries offering its passengers greater connections and travel options through agreements with major airlines such as Alitalia, All Nippon Airways (ANA), American Airlines, British Airways, LATAM Group, EVA Air, Iberia, Lufthansa, Hainan Airlines and Japan Airlines. Interjet was recently honored with Skytrax’s World Airline Award as the ‘Best Low-Cost Airline in Mexico and Best Cabin Crew in Mexico. In 2017, Interjet was awarded the Travelers' Choice Trip Advisor Award as the best Mexico airline.